Artists’ Reception: Friday, October 5, 2012, 5:00 – 9:00 p.m.
Panel Discussion about the Columbia/Kaiserslautern Artists Exchange: Sunday, October 7, 2:00 p.m.
Gallery Hours: Weekdays, 11 a.m. – 7 p.m.; Sat., 11 a.m. – 5 p.m.; Sun., 1 – 5 p.m.
For more than a decade, Columbia, S.C., artists and those of the Kunstlerwerkgemeinschaft (KWG) in Columbia’s German sister city of Kaiserslautern have been going back and forth across the Atlantic Ocean. Columbians Mike Williams, Stephen Chesley, Jeff Donovan, David Yaghjian, Tonya Gregg, Laura Spong and others went to Kaiserslautern to work and exhibit. KWG members Roland Albert, Ralph Gelbert, Klaus Hartmann, Reiner Mahrlein and Silvia Rudolf came to Columbia, and their work graces the walls and backyards of many a local home. During their Kaiserslautern visit last year, Donovan and Yaghjian even ran into a City of Columbia delegation headed by mayor Steve Benjamin. 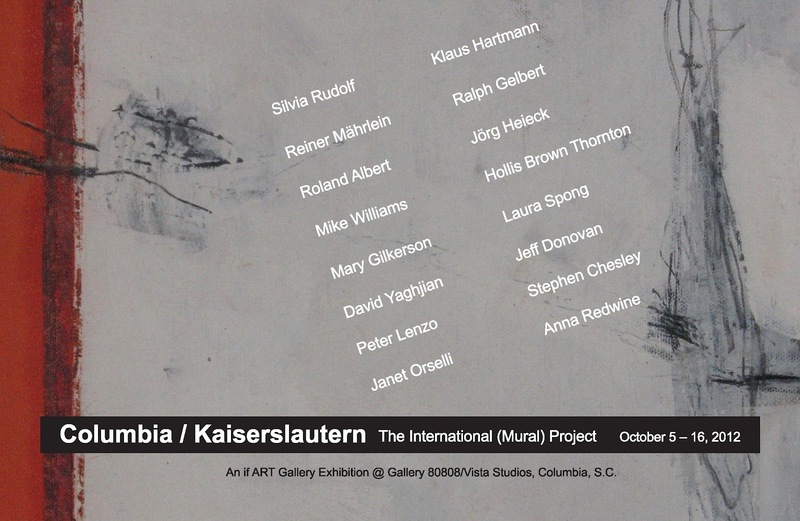 The informal artists exchange’s next installment is Columbia/Kaiserslautern: The International (Mural) Project, an if ART Gallery exhibition at Gallery 80808/Vista Studios, Columbia, S.C. Seventeen artists – six German, nine from Columbia and two formerly of Columbia – will participate in the event, which will consist, first, of the creation of a collective mural and, second, the exhibition. Two Kaiserslautern and nine Columbia artists collectively will create a mural at Vista Studios between September 29 – October 5. The mural will be on a patchwork of canvas pieces mounted to a wall as one single work of art. The German mural participants are Hartmann and Rudolf; the Columbia artists will be Chesley, Donovan, Mary Gilkerson, Gregg, Peter Lenzo, Anna Redwine, Spong, Williams and Yaghjian. The mural will be the centerpiece of the Columbia / Kaiserslautern exhibition. All mural artists also will be showing individual works in the exhibition, which will run October 5 – 16, 2012, opening with a reception on October 5, 5:00 – 9:00 p.m. Others participating in the exhibition are Kaiserslautern artists Roland Albert, Ralph Gelbert, Reiner Mahrlein and Jorg Heieck; Aiken, S.C., artist H. Brown Thornton; and Columbus, N.C., artist Janet Orselli, who is a Columbia native. The collective mural will be shipped to Kaiserslautern after the exhibition. In Kaiserslautern, the mural first will be exhibited in its original form. Next, KWG members will add to the mural, exhibit the new version and then ship it back to Columbia.